winemaking, with the vibrancy of California. Our current release offers dazzlings wines, with remarkable balance between power and elegance that defines the greatest wines of the Santa Ynez Valley. To best ship you product, we require a 3-bottle minimum on your web order (this can be mix and matched). Thank you! 2013 Cuvee Constantine ($60). Fully bodied with silky tannins, deep purple elegant wine with fragrant notes of clove, plum, leather and vanilla. 2012 Cuvee Matia Grenache ($55). 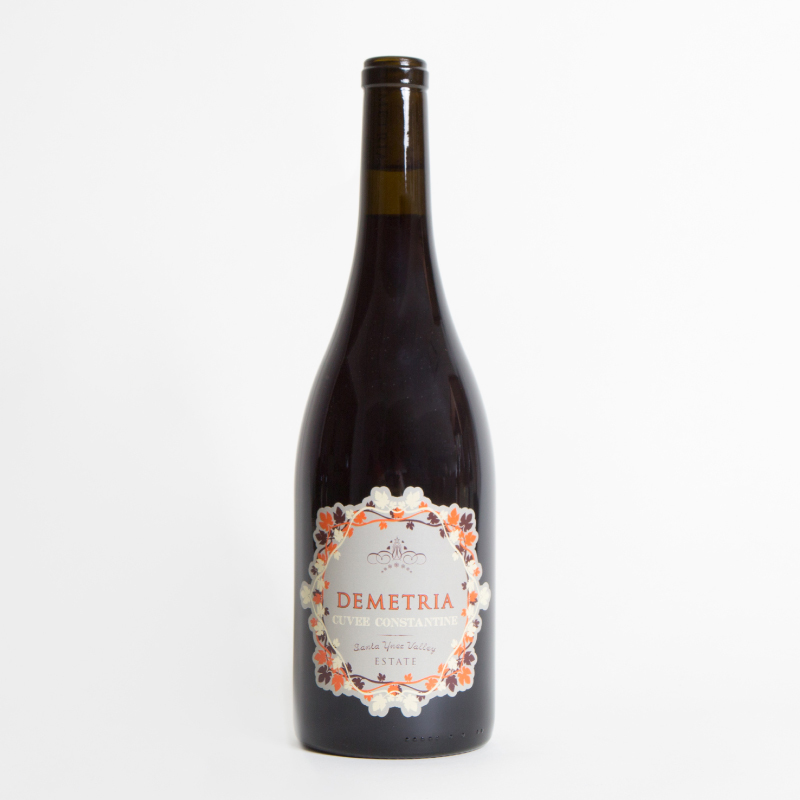 Whole-cluster grenache with a nose of cherry cola, coffee and violets with a mouth of bittersweet chocolate, blackberry and red plum. 2012 Halcyon Days Pinot Noir ($65). Whole-cluster pinot noir with a rich palate. Black cherry, rhubarb, strawberry syrup, violets, fennel and lavender. You save 20% off individual bottle pricing and receive free shipping! Limited supplies. Cheers! Use Code "3PACKFREE" in Checkout for Free Shipping (click on 'show order summary' in checkout). Made from our award-winning Year's Best Rosé (Wine & Spirits Magazine)! Pale pink in color, this light-bodied sparkling offers delicious, tiny bubbles with undertones of strawberry, rose petal, bubblegum and wild fennel. The balance of fruit and vibrant acidity lead to hints of stonefruit, watermelon and a lasting finish. The intoxicating nose offers black cherry, herbs du Provence, mocha & toffee. 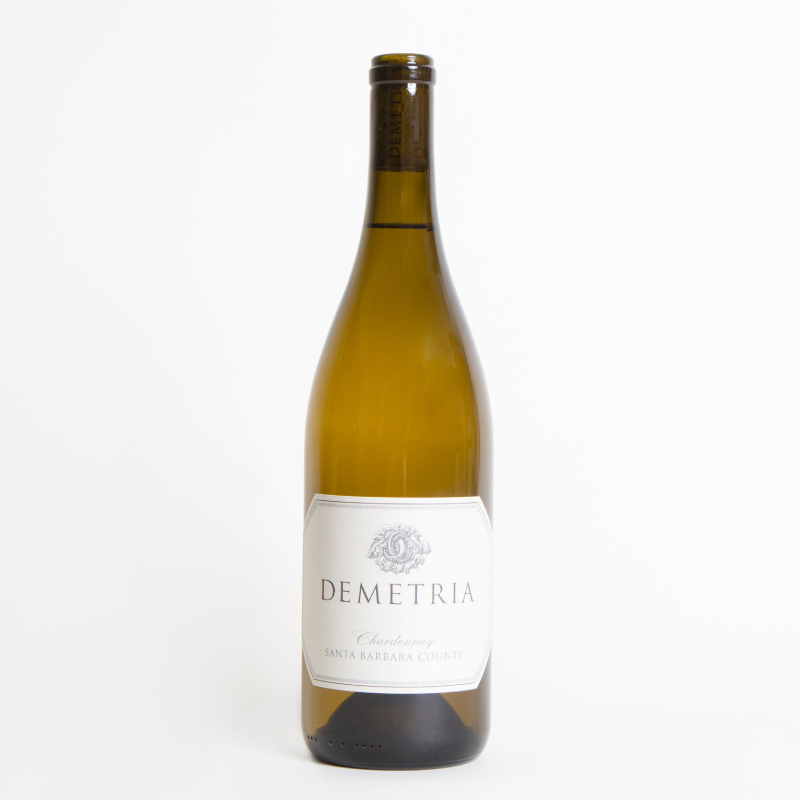 The texture is unlike any other wine we make here at Demetria; it's polished, rich and concentrated yet never overpowering. The flavors build in your mouth to show stunning characteristics of raspberry ganache, blackberry, smoked bacon and Turkish coffee which lead into a harmonious finish. Will benefit early decanting & will age beautifully for 13-15 years. This is a full bodied wine with silky, yet powerful tannins. Deep purple in color, this elegant wine shows fragrant notes of violets, plum, black cherry and vanilla. The wine opens up with flavors of blackberry, caramel and a sweet oak backdrop followed by licorice, mocha and chalky minerals. Elegant as well as substantial this wine shows captivating aromas of lavender, violet, kirsch, blackberry, along with herbs de Provence and licorice. The flavors build in the mouth developing into sweet raspberry and blueberries, with notes of bittersweet chocolate, complex dried fruits, and leather. This wine is a seamless blend, proving earthy and intense in the mouth, the wine finishes with fine dusty tannins. Deep ruby in color, this stunning wine exhibits notes of black cherry, fresh tobacco leaves, cocoa powder and wild blackberry. Comprised solely of the 770 clone and the fruit was hand-picked in the early hours of the morning. Beautifully balanced and is extremely food-friendly. Vivid ruby-red in color with expressive aromas of cherry, candied raspberries & fresh cut oak. Rich, bright and fleshy offering rhubarb, herbs de provence, dried currants, sassafras and cola on the palate. Powerful but at the same time quite elegant, this beauty has medium-bodied richness and depth and finishes with wonderful acidity, length and smooth tannins. Delicious aromas of bright cherry, raspberry and cassis are highlighted by sweet spices including hints of anise and black tea. Soft and smooth in the mouth, the flavors build to include a strawberry, tobacco, white pepper and a creamy boysenberry note. Medium bodied, full flavored, and leaves you craving a second glass. Serve Pantheon with your favorite barbecue fare, pizza or simply with a cheese & charcuterie platter. 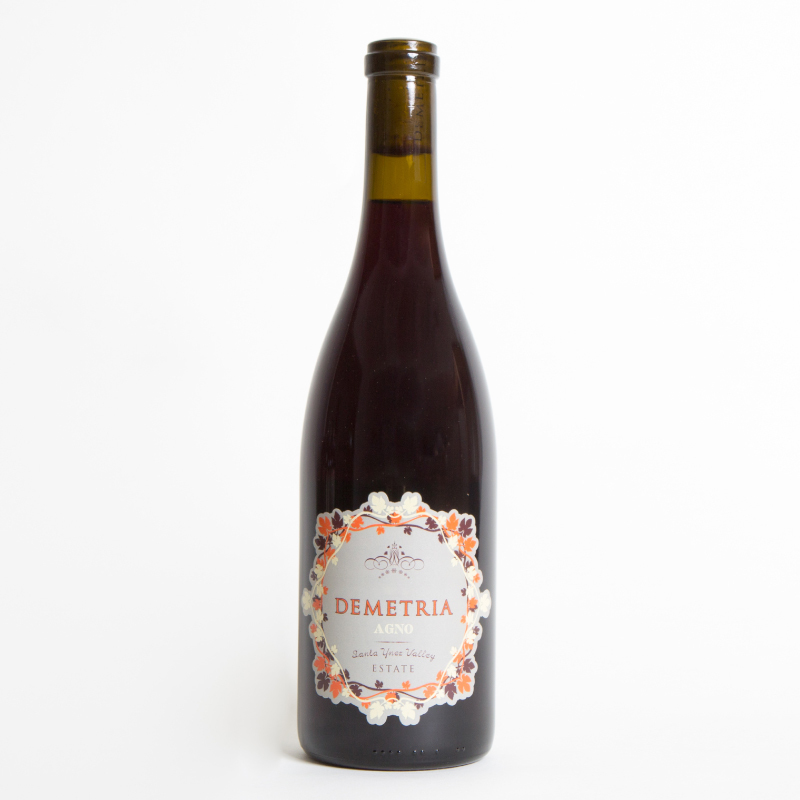 This wine is bright-garnet in color and is followed by a beautiful expressive nose of black cherry, rose petals, vanilla toast and boysenberry. Offering both red and black current nuances intermixed with hints of Chines five spice, plum, sassafras and mushroom. Elegant and aromatic with notes of apricot and white peach on the nose and green apple, baked pear, wet stone, and floral notes of honeysuckle and citrus blossom emerging on the palate. Lively and straightforward, yet round and complex, the exquisite balance of acids and fruit will leave you craving a second glass! All the usual Condrieu aromas of white peach and citrus are given complexity by crushed stone and hints of honeysuckle. The clean yet complex palate displays pretty floral characters with elements of baked pear, apricot, lemon zest, brioche & gardenias. Beton Blanc, meaning “Concrete White” in French, is fermented and aged in our concrete eggs. Bright in color with subtle hues of green, this wine is crisp and refreshing. Offering compelling notes of honeydew, kiwi and lemon peel complimented by grapefruit, green apple, lemon-lime soda and a clean minerality on the palate. The racy acidity of the wine is an unbeatable match for shellfish - pairs beautifully with oysters, shrimp, grilled fish and our favorite pairing - bouillabaisse! A classic golden color with subtle emerald hues in the glass. The wine is deeply expressive on the nose with heady aromas of lemon curd, orange blossom and pineapple complimented by rich tones of shortbread and papaya with pretty rose petal floral notes. Rich, yet structured in the mouth, the flavors echo the nose and build to include green mango, marzipan and pear finishing with a clean citrus acidity.